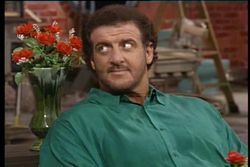 First appearance "Marianne and Luigeena"
Lyle Alzado (April 3, 1949 – May 14, 1992) was an American football player and an apparent friend of Mario and Luigi who visited them occasionally at Mario Brothers Plumbing. In The Super Mario Bros. Super Show! live-action segment "Marianne and Luigeena", Lyle pays a visit to Mario and Luigi, but when he arrives at their apartment, the two are out getting refreshments. Deciding to simply wait until Mario and Luigi arrive, Lyle begins to make himself comfortable, only to be disturbed by Mario and Luigi's cousins, Marianne and Luigeena, who are obviously infatuated with him. Continually flirted with by Marianne and Luigeena, a nervous Lyle keeps trying to spurn their advances while waiting for Mario and Luigi. Eventually, Luigeena leaves to look for her cousins, leaving Marianne alone to flirt with Lyle some more, forcing him to try and ignore her until Luigi arrives. Marianne soon leaves to search for Luigeena, though not before reminding Lyle of their date that night, much to Lyle's horror. After meeting with Mario, Lyle is later informed by Marianne and Luigeena that their date with him is canceled, as the two decide to go off and stalk Mel Gibson instead. This leaves Lyle somewhat depressed, as he had actually wanted to go on a date with Marianne and Luigeena, though when Lyle tells Mario and Luigi this, the two simply think he was joking. This page was last edited on May 30, 2018, at 11:41.